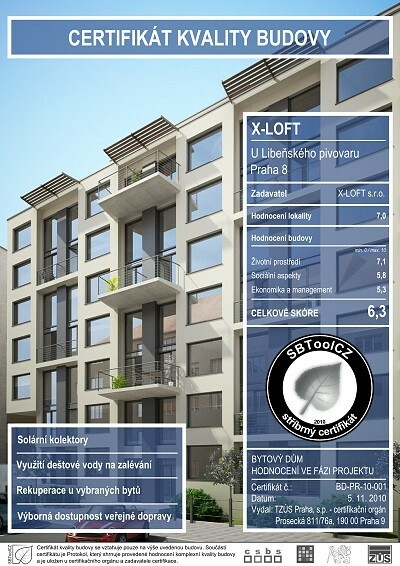 Project X-LOFT is the first residential project in the Czech Republic to receive the silver certificate from the Technical and Test Institute for Construction in Prague, in conjunction with the Technical University ČVUT, proclaiming the quality of the building. SBToolCZ uses a special methodology to evaluate the building with respect to sustainability (made up of several components, including human and social environments, construction quality, operational costs, etc). Ecological and economical living – Project X-LOFT flats are economical on their inhabitants as well as on the nature. Enjoy a modern, cost-effective, healthy lifestyle. Home heating - Project X-LOFT has paid special attention to the heating of the façade. We used above-standard insulation, guaranteeing a minimal loss of heat. Triple glass-pane insulation – triple pane windows are installed in order to minimize heat loss and also isolate noise. Solar collectors – save on heating costs! In the summer months, solar panels can provide up to 100% energy to heat water; in winter the gas boilers take over. Heat conservation - reduces energy loss associated with traditional systems. The result is not only a substantial savings in heating costs, but also cleaner air inside, thanks to filtration and circulation. Waste sorting - in the building you will find a place for sorting your waste. Recycling saves on natural resources and conserves the environment. Rainwater retention - especially in the sultry summer weather, preservation of green areas requires regular watering. The retention of rainwater in underground cisterns results in decreased consumption of drinking water. The estimated cost of operating expenses is 1,550 Kč per month. The amount includes lighting, cleaning, household solid waste management, safety, operational fund, cold water, pool repairs, elevator, throttle.